Review Context: I’ve played a lot of open world games, but prefer games where customization is the focus. Playing open world games with customization allows me play the game my way instead of a linear story with limited customization. It also helps when I play a game where I can put myself in the game by creating a character of me instead of a default. The first thing you will see right off the bat is how bright and colorful the game is. 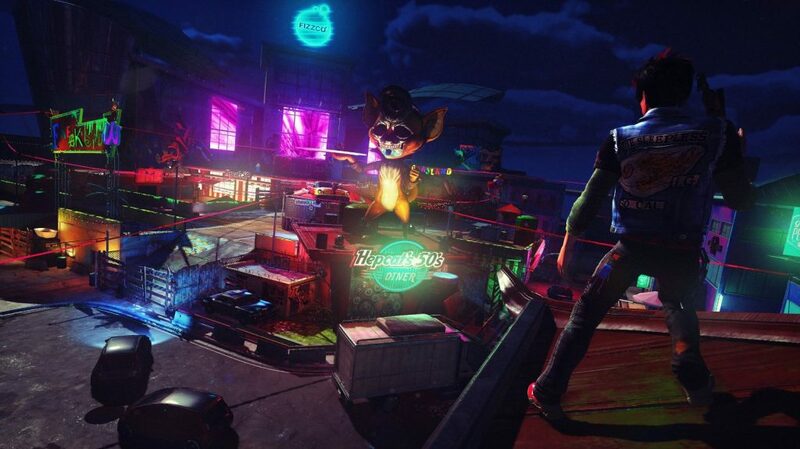 They hold no punches showing off the vibrant world of Sunset City. 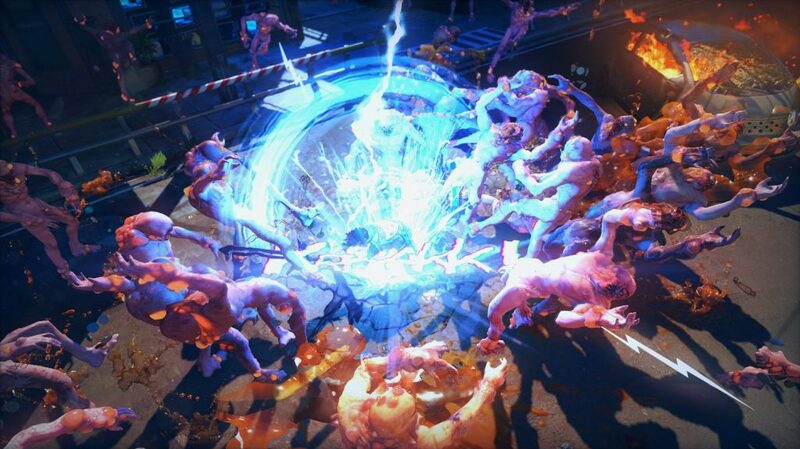 The game goes for a cartoony look with the visual effects you see in comic books, such as “BOOM” displayed after something explodes. You’ll be seeing so much orange when you smash up monsters you’ll be craving for an orange soda. If violence and gore isn’t your thing (despite the Mature rating), you can turn it off. The character animations are smooth with no jagged movements. The only drawback is with all the craziness going on the game runs at 30 FPS, while I feel having the game run at 60 FPS would help improve the experience. Aside from that, the character and enemy designs are nicely done with lots of creativity with the monsters (OSD). While the game does its best to explain the controls via tutorial (which the game calls out on), it does take some time to understand the gameplay. You can grind on everything while bouncing on certain objects. When you get weapons, there is no aim down sight to give it a feel of shooters from back in the day. Switching weapons requires you to hold the left bumper, while selecting with the left stick. While you do this the game slows down to give you time, but the game will resume regular speed if you take too long switching weapons. The right bumper lets you glide for a short period for a burst of speed. There are moments when the game becomes a tower defense genre and you use the D-pad to choose different traps to lay down. To sum it up, just about every button on the controller is used and learning the control scheme takes a while before it becomes second nature. Right from the first trailer shown at E3 this game is not meant to be taken seriously. 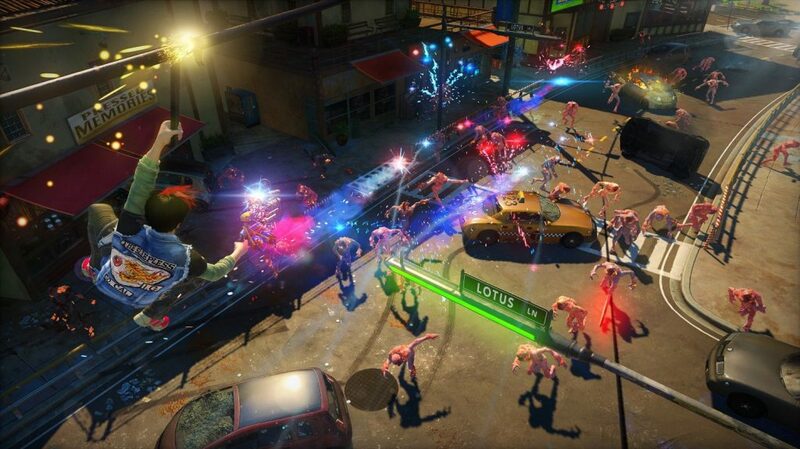 Some people call this game very ‘DeadPool-ish.’ I’ll explain later, but the story is generic, with the city being overrun by OSDs due to a faulty soda, but the character customization is amazing. I would say it’s as good as the Saints Row franchise, as the marketing also promoted that as well (character customization). Insomniac Games is known for over the top weapons and they don’t disappoint. The main point of the game is to rank up your combos. The higher the combo, the more damage is added. By doing this, you can add amps to your weapon (and your character that is named Player) for that extra kick. To gain combos you must consistently move while gunning down your enemies. If you play the game like a normal third-person shooter you will die immediately. The gameplay blends the crazy trick style of Jet Set Radio with third-person shooter mechanics. During the story you come across side quests. Due to the huge overlay of the map, you can fast travel, which can lead to some funny animations of how you get to the location. The game lets you know it’s a video game with its constant fourth wall breaking humor which might turn off some people. The humor also comes when you have to help people that follow a certain trope. From the LARPS vs Jocks, to the WASP, and the “I told you so” old man, among others. While some may find this type of humor outdated, I found it funny since I know the game is not taking itself seriously. They even go as far as to call out certain message board sites. Because of this, people considered this a ‘Deadpool game.’ I wish more games were like this, since video games are escapism. To me at least. There is online support in multiplayer with team deathmatch to see which team can kill the OSDs the most with a leaderboard for some of the side quests as well. 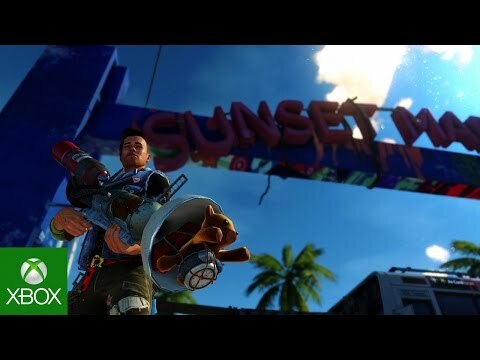 There was Sunset TV in which the host gave you some info and tips on the game, with a shout out to the community. The show has been cancelled, but as a bonus, if you want to know what happened to the host it is explained in the DLC as it gets very meta. The soundtrack is done by a local indie band and the tone of the music works perfectly with the game, even when the character says that a certain genre should be played in the moment. Voice acting is done well with the side characters and the main character. I played both male and female versions and found the female voice funnier, while the male sounded more jerkish. Just like the violence, if foul language isn’t for you turn on the filter to hear crazy sound effects. The effects of the weapons sound great along with the gooey sound of the OSDs exploding. I may be biased since I love that the explosions are followed by a “BOOM” and other comic book texts when something amazing happens.